On Monday, Sirius XM Holdings Inc. (SIRI - Get Report) shook things up following the announcement that it was buying streaming music company Pandora Media (P in an all-stock deal worth $3.5 billion. The reaction was an ugly one for shareholders in Sirius XM - shares shed more than 10% to start the week, the worst single-day session for the stock since 2011. Wall Street analysts are mostly expecting the deal to happen, but the more pressing question right now for both Sirius and Pandora shareholders is whether this stock's solid momentum heading into October can hold up. At the start of the week, Sirius XM's stock price had been up almost 35% in 2018. With Monday's post-deal-announcement drop, those gains have been pared down to around 20% on the year. Shares have spent most of the year in a very well-defined uptrend, bouncing their way higher on half a dozen tests of trendline support between February and early September. But that uptrend got violated in a material way following the Pandora acquisition news. In the short term, that trend line break is troubling. It takes a stock that's traded in a tight, high-probability range and adds a lot of uncertainty to Sirius XM's price trajectory for the rest of the year. The good news for investors is that, longer term, things are looking a whole lot more constructive. Sirius XM's stock price has actually spent the last two years in a very well-defined uptrend. And while Monday's double-digit drop looks especially ugly on a shorter-term chart, it looks less scary in the context of this stock's two-year run. Shares sold off to trendline support this week; that means that a bounce higher from here could actually be a solid buying opportunity this fall. Simply put, Sirius XM is in make-or-break mode right now. 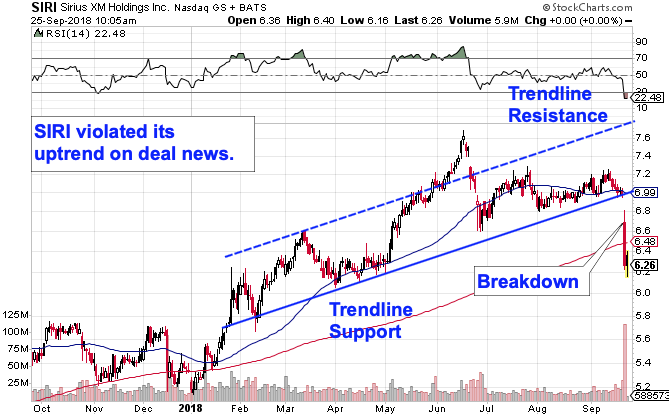 If shares can muster the strength to catch a bid at long-term support, then it makes sense to jump into the long-side of this trade for the next up-leg in the trend channel. 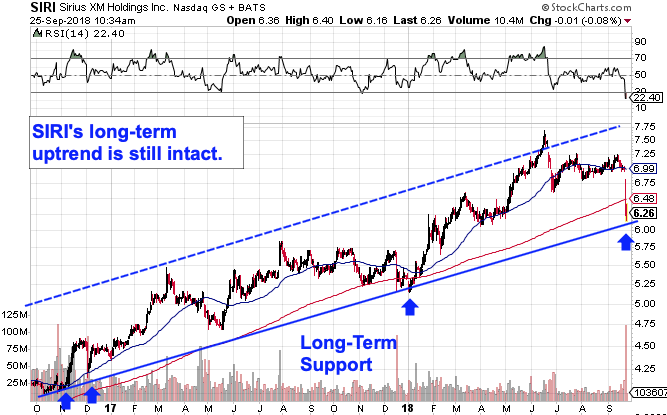 Otherwise, if Sirius violates this more significant long-term support level, then the uptrend is broken, and it makes sense to steer clear of shares for the intermediate-term. If Sirius XM bulls do assert themselves here with a bounce higher, risk management remains critical. The $5.75 level is a logical place to park a protective stop in Sirius XM - if that line in the sand gets broken, the uptrend is over.